“I just wanted to affirm how much I enjoyed the flute workshop. You are a good teacher. I felt supported and encouraged and have played the flute each day since the workshop several weeks ago. I also found the instructional cd to be useful. The entire experience was positive. I don’t know that I’ll ever be a gifted player but the experience of playing is peaceful and fulfilling all on it’s own. From toning in street run off tubes as a child to using her voice for healing and then using the flute for healing herself and others, Twinfeathers has come to really understand the human basic need for connection to “Source” (Love, God, Creator, Higher Power, etc.) and to each other! The sounds of the Native American Flute (NAF) can help us reconnect or make a stronger connection with our “Source” by opening our hearts energetically, allowing our natural state of Love, Peace and Contentment to expand. Healing comes in many forms and on many levels, and we never know what effect the sounds of this “Inner Peace Pipe” may have on others until we get specific feedback. Twinfeathers has many stories of people and animals responding to the sounds of the flute, as well as her own experience of it as a vehicle of Love’s expression with her healing journey. Twinfeathers has been playing and teaching how to play the Native American Flute for over 17 years. She “received” her name, Twinfeathers, from the hummingbirds as they danced a song as she walked on Tumamoc Hill in Tucson, several years before being introduced to the flute (see video above). Her passion for sharing her gift is apparent in the way she embodies the “spirit of the room” when she creates improvisations for any event or purpose. She can also set a desired mood (uplifting, somber, light and playful, etc.) on demand which is very helpful when planning an event with multiple elements. Since she was ordained as an Interfaith Minister at the One Spirit Interfaith Seminary in New York City in 2008, Twinfeathers’ ministry has been music and her intention is to assist others in experiencing present moment awareness through playing the flute and/or sounding alone or in a group. She helps students connect their heart, the flute and the environment, to create unique magical melodies in the moment. When there are enough of us opening our hearts to higher levels, we will start caring for each other more and a shift in consciousness will happen for the entire planet. A pipe dream? Maybe, but Twinfeathers is not the only one with this intention and science is proving that we have the amazing power to change everything very quickly! How are you contributing to World Peace? 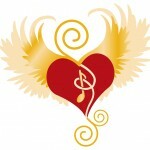 Music is Life, that’s why our hearts have Beats!